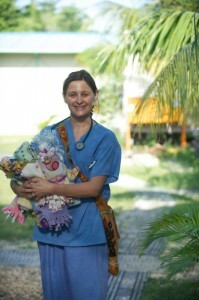 Julie Tsirambidis examines a baby at St. Damien Hospital in Port-Au-Prince, Haiti. 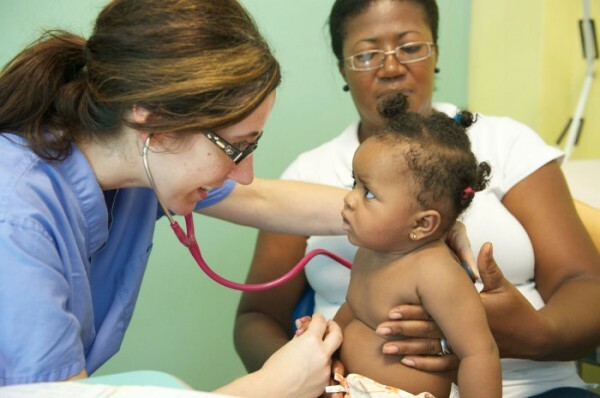 The Ohio Chapter of the National Association of Pediatric Nurse Practitioners (NAPNAP) will recognize Tracey Herstich and Julie Tsirambidis for blazing new trails from Akron to Haiti at a luncheon in Columbus on Oct. 19, where they will be named Pediatric Nurse Practitioners of the Year. Last fall, Julie and Tracey traveled to Haiti with other members of Akron Children’s medical staff to provide care at St. Damien’s Hospital, a children’s hospital near Port Au Prince. The goal of the trip was to lay the foundation for a program to train and educate Haitian nurses who want to earn master’s degrees and become nurse practitioners. The biggest obstacle is financial – securing the funding to pay for about 10 nurses to take time away from their daily work schedules. Once that obstacle is overcome, having a steady supply of nurse practitioners will go a long way to improve access to care in a country that currently only has one pediatric healthcare provider for every 100,000 children. Julie and Tracey said they are “humbled” by the award and hope it promotes better recognition for their profession. Nurse practitioners are registered nurses with master’s degrees and board certification in a specialty, such as pediatrics. They can perform physical exams, order medical tests, write prescriptions, treat common illnesses and manage chronic diseases. They maintain a close relationship with doctors and consult them as needed. “Nurse practitioners are on the front line of healthcare delivery and how it’s changing to improve access to care,” Julie said. Tracey believes that together she and Julie are good examples of the excellent career opportunities for advanced practice nursing. When she’s not leading their global initiative, Julie serves as the director of the Advanced Practice Center at Akron Children’s Hospital and provides care to patients at the Akron Children’s Hospital Pediatrics‘ office in Brecksville. Tracey is a critical care nurse practitioner in Akron Children’s pediatric intensive care unit.